My first overnight hike on the FLT. After I started hiking the FLT and decided to make it my goal to hike the entire main trail, an end-to-end, I also set some other smaller goals; I wanted to do an overnight “camp-out” hike and I wanted to do a “marathon” hike (a hike that was at least 26.2 miles). I had completed the goal of the “marathon” hike the year before in july 2012, hiking 26.9 miles in 12 hours, but I still had not done an overnight hike. So I decided it was time to check that off my list. I had grown up in rural upstate New York, so camping was nothing new. My childhood consisted of hiking, cross-country skiing, and camping out in the woods near my house, so I knew what to expect, at least in a general sense. 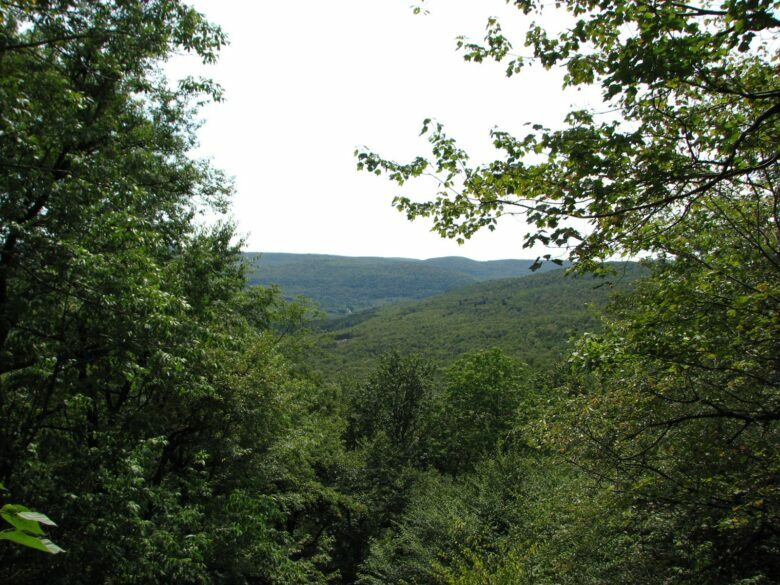 I also had hiked the FLT for several years and was familiar with the trail and the areas around the trail. Even with all that experience sometimes things don’t always go how you expect or plan. To understand my story it helps to have some more information, more than I had when I was preparing for the hike. What I did not know was that the section of trail I was planning to hike was possibly the ruggedest on the FLT. By the end of my hike I logged almost 4700 feet of climb over two days. It is also important to note that when hiking for multiple days you need to bring all the supplies with you; additional food and water along with overnight gear which you do not have on a day hike. This means that your pack will weigh more. I had planned out my hike well in advance. 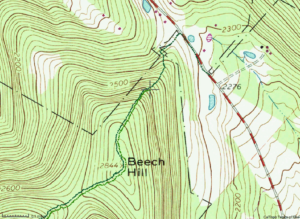 I would start from Beech Hill Rd and head west to Campbell Mountain lean-to. 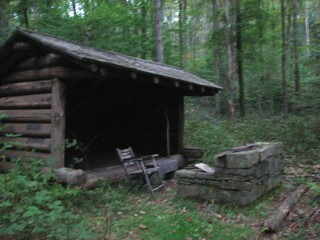 My previous hikes that year had been 16 – 20 miles so I expected that I could hike the 14 miles to the lean-to. The week leading up to the planned hike I checked and re-checked the weather forecast. The weather looked to be good with no rain in the forecast and nice temperatures. I planned out my food as well. For dinner I would carry a small can of beans and some hot dogs. My breakfast would be a couple of packets of instant oatmeal and some hot chocolate. I also would carry some slices of bread, a little peanut butter and jelly. I froze a couple of bottles of water to double as freezer packs and that I could use after they had melted. The morning of the hike dawned and I began to pack all my supplies together. After packing everything I decided to weigh my pack and was surprised to find it weighed around 50 pounds; at least 15 pounds more than my usual pack. It had taken me a little longer to get everything together than I had wanted and I did not leave until after 8 am. I had a little over 1:30 drive to Beech Hill Rd. 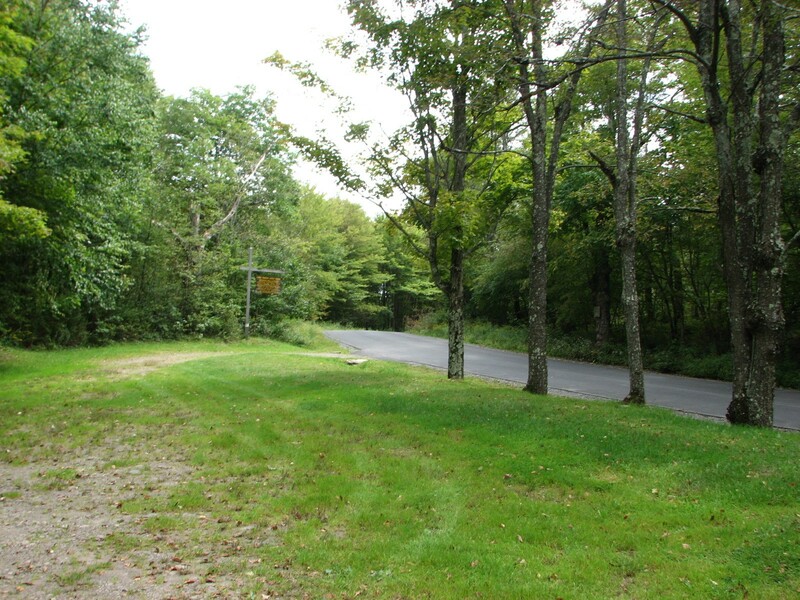 I parked at Beech Hill Rd, it was sunny and the temperature was around 60, perfect hiking weather. There was a DEC trail register at the parking area and I signed my name in and started out (mile 0.0 – 9:50 am). I headed up the road for a short distance before turning left off the road and heading up a logging road. The road climbed up towards the woods. Shortly after entering the trees a sign directed me left off the logging trail and up a climb to the summit of the hill. I shifted my pack on my shoulders, the weight was more than I was used to. The trail here was steep and I had to pause to catch my breath after a short distance. I checked my GPS and found I had gone less than 0.5 miles, but I had already climbed 300 feet since leaving my car. I also discovered that I had forgotten to start the track recording (mile 0.45 – 10:08 am). After catching my breath and starting the GPS track recording I pressed on up the hill. My pack was weighing on me and I was struggling up the steep climb. I was only able to hike another 0.2 miles before having to stop and rest again (mile 0.65 – 10:19 am). I checked my GPS and found that I had climbed another 250 feet. I hoped that the rest of the hike would not be like this or I would be in for a rough time. After a brief rest I continued on and finally reached the top of Beech Hill. 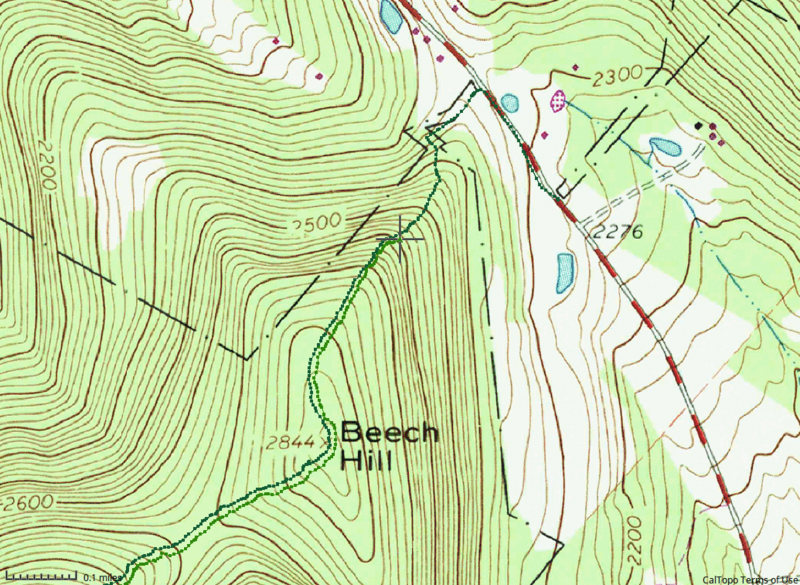 The trail now descended into a saddle between Beech Hill and Middle Mountain. I found a small vista on my climb up to the top of Middle Mountain and stopped for a short break. I could see the valley below through a break in the trees. It had taken me over an hour to get to this vista and I had only gone 1.35 miles (mile 1.35 – 10:49 am). I pulled my pack back onto my shoulders and continued on up to the top of the Middle Mountain. After reaching the top the trail descended nearly 700 feet over the next mile to Mary Smith Hill Road (mile 2.50 – 11:31 am). The weight of the pack was bearing down on me and I began to get “charley-horses” in my legs and found myself short of breath. I paused several times on my way down to catch my breath and ease my aching legs. At one point I found a large rock next to the trail and sat down letting the weight of the pack rest on the rock and lift off my shoulders. I crossed Mary Smith Hill Road and started the climb up the next hill. I hiked another 0.2 miles and 225 feet before needing to pause to catch my breath once again. After a short rest I moved on and climbed the rest of the way to the top of the hill. I came to another vista and stopped to rest and take a few pictures (mile 3.00 – 12:01 pm). After leaving the vista behind I continued on to the top of the hill. The trail turned to follow a ridge line and began a gradual descent for the next mile. My legs were tired and my back and shoulders ached. I found a nice spot to take a longer rest break and took my pack off and got some water and some trail mix (mile 3.70 – 12:39 pm). After resting for about 15 minutes I re-shouldered my pack and moved on. Shortly before reaching the top of Mary Smith Hill the trail took quick climb of about 80 feet. Once I made it to the top I was again out of breath and needed to rest. After a short rest I followed the trail down towards Holiday and Berry Brook Roads. The trail descended nearly 600 feet over the next mile. My legs strained and hurt the whole way down and when I finally reached the bottom and the road I was tired and sore. There was a parking area at the road crossing and I dropped my pack and sat down to rest and have some lunch in the grass (mile 5.65 – 1:51 pm). I realized that at the speed I was traveling I would not be able to make it to my planned destination. I was only traveling at around 1.4 mph, it was almost 2 pm and I had not even traveled halfway to the Campbell Mountain lean-to. I still had over 7 miles to go and there was no way I would be able to make it before dark. Fortunately DEC signs the trails in the Catskills region well. There was a map posted on a sign board by the parking area as well as several signposts at the trailheads showing distances to various locations. I saw that there was a lean-to 3.3 miles away called Pelnor Hollow lean-to. It was off the main FLT track, but I was pretty sure I could make that distance. I set out again and started another climb. This climb was not as steep as the previous ones. I made it 0.8 miles and 350 feet before needing to take a rest, but I was getting tired. I thought about just finding a couple of trees off the trail and hanging my hammock up and slinging a tarp over the top, but I would still need to build a fire ring or forego a fire, neither appealed to me much and the lean-to was not far. A short distance later I heard loud crashing sounds, something large was running through the woods towards me. My first thought was wild boar, although they are not common in this area. I backed up to put a tree at my back and brought my walking stick up ready to defend myself or at least give myself a chance to get away. Seconds later two black bear appeared, chasing each other through the woods. They bolted across the trail before turning and disappearing back into the woods. I stayed still for several more minutes listening in case they turned to come back, but they were gone. 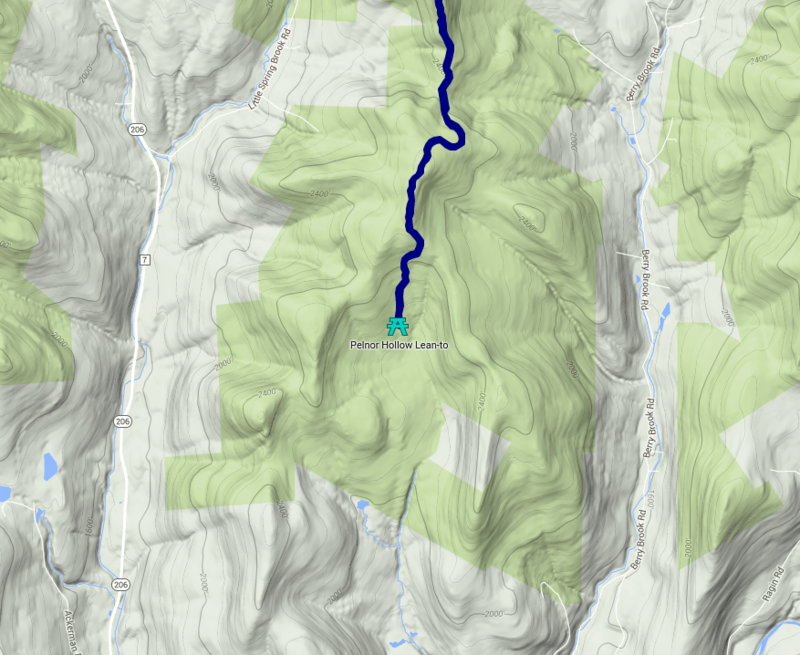 I continued on and came to the Pelnor Hollow trail junction (mile 6.85 – 3:02 pm). The main FLT turned right, but the sign pointed left for the Pelnor Hollow lean-to. So I turned off the FLT track and headed towards the lean-to. The trail passed through some small patches of briars, but a clear path had been mowed through. About 0.4 miles from the trail junction the mowing veered slightly to the right and stopped. It looked as if the trail curved to the left, so I assumed that the mower had just turned around here. I soon lost the trail and back-tracked to the mowed path (mile 7.25 – 3:13 pm). The mowed section of the path ended in a wall of briars. I searched for the blue trail marker disc and soon found it – in the middle of the briar patch. I had encountered briar patches on previous hikes that I had to push through and usually they were only a short length. The longest stretch I had encountered was 0.25 miles. For those unfamiliar with the term, briar is something of a generic term and is usually associated with wild blackberry or wild rose bushes. They have long vine-like stalks that are around 1/4 – 1/2 an inch thick and have thorns. The stalks can grow very long, easily 5 – 10 feet long, and they grow profusely. The vines can wrap around you and snag at you as you pass through. I was wearing shorts and a t-shirt since the weather was warm and I knew I would likely get some cuts and scratches, but I was close to the lean-to, only around 2 miles away and I wanted to get there and be able to drop my pack, so I waded in. The trail was hard to find because it was so overgrown with briars, but I knew what to look for; a slight depression from where people had walked and a slightly less dense area of briars. I also continued to look for the blue trail marker discs to help guide my direction. The briars were thick and deep, but I pushed on. 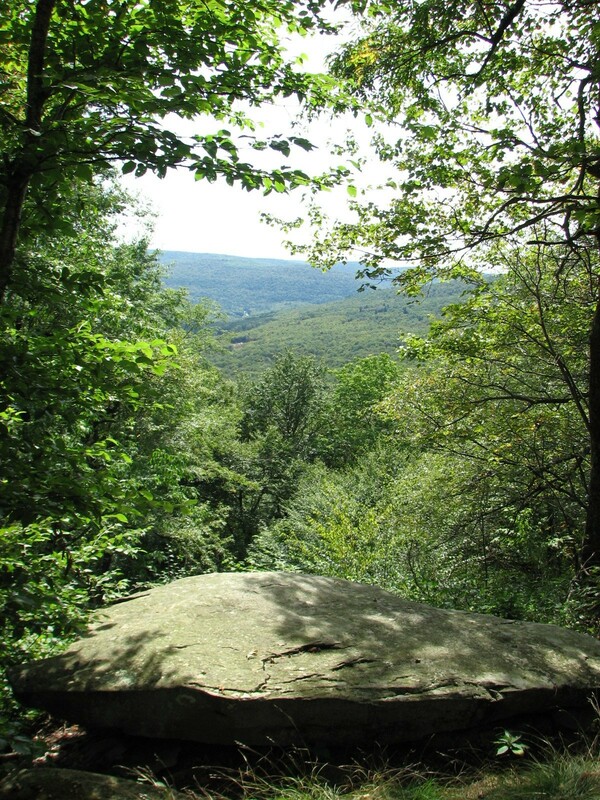 The trail led me to a large rock that I was able to climb up on and take a survey of the area (mile 7.35 – 3:17 pm). All I could see in every direction were briars, but I saw the blue marker ahead to my right on a tree in the middle of the patch. I hopped down off the rock and waded back in heading towards the tree. I reached the tree and looked for the next blue disc. After some searching I found it, only a short distance ahead down in the briars on a tree that had fallen over. I slowly waded through the briars to the fallen tree and the next disc. I reached the tree and threw one leg over stomping down the briars to make some room. I sat down on the log and looked for the next blue disc. As I climbed over the log a nail caught on my shorts and ripped a small hole in the seat. I waded on, continuing the pattern of looking for the slight signs of the trail, reaching a blue disc and searching for the next. At times the briars reached above my head. They snagged at me and whipped around my legs causing me to yell in pain as they ripped. Finally after what seemed to be miles, the briars thinned and finally fell away; I had waded through 0.4 miles. I found myself under some small pine trees and the ground was clear. I sat down to take a break (mile 7.65 – 3:32 pm). My legs were cut and scratched and blood had stained my shorts. My arms were also scratched and my shirt had nats where the thorns had grabbed it and pulled the cloth. My legs burned, both from sore muscles, but also from the cuts. I thought again about stopping and just finding a place to camp out, but I was so close to the lean-to and I had already pushed through the briar patch. I stubbornly decided to push on. I came around the small stand of pines and saw that the trail led me back into the briar patch again. The copse of trees I was in had only been a brief reprieve. Still I pushed on and waded in. Following the same pattern as before, find a blue disc and searching for the next. The trail was climbing now up to the top of a hill. After a climb of about 200 feet I crossed the top of the hill and began to slowly descend. The trail began to descend at a steeper rate and the briars started to thin before falling away; this time for good (mile 8.45 – 4:08 pm). I could see the woods ahead of me and a clear path. I had waded through nearly 1.2 miles of briars. I started down into the woods and pulled my cell phone from a clip at my belt – I had one bar of signal and then it was gone. I stopped and turned back toward the briars, climbed to the edge and found signal. I tuned back down the trail, I would have to come back here once I had the coordinates of the lean-to and let people know where I was. The trail turned to the right and then back again to the left all the while continuing down. After hiking about 0.7 miles and descending over 400 feet I saw the lean-to ahead. I had made it, it was 4:30 pm. I dropped the pack on the floor of the lean-to, got some water and just sat and rested for several minutes (mile 9.15 – 4:32 pm). Unfortunately I still had several things to do, so although the hike was done, I could not rest yet. I took the GPS coordinates of my location and headed back up the trail, this time without my pack. I reached the edge of the briar patch where I had a few bars of signal and began to text everyone telling them about my change in plans and my new location for the night. I said an early goodnight to my girlfriend, she was worried and not happy that I did not have signal at the lean-to and also that we had to say goodnight so early. I promised her I would text her first thing in the morning once I was back in signal. I walked back to the lean-to and began the task of getting the campsite ready. I hung my hammock in the lean-to and then went out and collected wood for a fire. After several trips I had a good pile of wood. I sat and rested for a while and listened to the silence. The shadows were getting long and the light was fading. I was in a valley that opened to the south, so the sun was dropping behind the hill to west quickly. I started my fire and soon had a nice blaze going. I roasted my hot dogs on a stick over the fire and cooked the beans in a small pan. After finishing dinner and cleaning up I sat and watched the fire play with shadows and listened to the snap and crack of the wood as it burned. The air was turning cooler now that the sun was down and I changed into jeans and pulled on a sweatshirt. The dancing flames of a campfire have a somewhat hypnotic effect and I was tired from a long and difficult day, so I crawled into my sleeping bag and hammock and was asleep by 9 pm. I woke a little before 6:00 am, the sky was just beginning to lighten and it was chilly, foggy and damp . I stirred my fire to life again and added some wood. I soon had water heated and made the hot chocolate and instant oatmeal. The warmth from both felt good. After cleaning the dishes I rolled up my sleeping bag and took my hammock down and repacked everything for the journey back. I put the fire out, took a quick picture, and one last look around before starting up the trail (mile 9.15 – 7:06 am). I climbed up to the edge of the briar patch (mile 9.85 – 7:43 am), where I had cell signal and texted my girlfriend that I was OK and was on my way back to my car. She was relieved and happy to hear from me. I texted everyone else to let them also know that I was OK and then braced myself to wade once more into the briar patch. It had not entered my mind while I was wading through the day before that I would have to go back through. This time I was wearing jeans and a sweatshirt, so my legs and arms were protected. I pushed through the briars to the top of the hill and started down. Before long I found myself again in the small copse of trees that was a break in the briar patch. I did not stop this time, but pressed on. I crossed over the fallen tree that I had ripped my shorts on the day before, being careful to not catch myself on the nail this time. 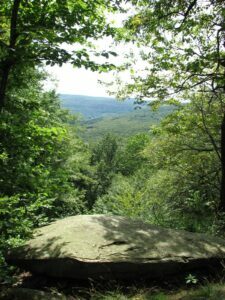 Then I climbed over the large rock that I had surveyed the briar patch from and a short distance later was free of the briar patch (mile 11.05 – 8:23 am). I came to the trail junction not long after leaving the briar patch behind and took a rest break (mile 11.45 – 8:39 am). The fog was still hanging low in the sky and it was damp. It had drizzled a little while I was working through the briar patch. I started the climb down to Holiday and Berry Brook Roads. 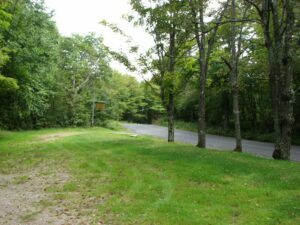 I crossed the road (mile 12.65 – 9:18 am) and took another short break in the parking area where I had eaten lunch the day before. After a quick rest I pushed on up the steep climb to the top of the Mary Smith Hill. I had to stop and catch my breath after climbing 400 feet in 0.3 miles. After catching my breath I pushed on again up the hill, but only managed another 0.1 miles and 75 feet before needing to rest again – I had pushed too hard in my desire to get back and I needed a longer rest. I took my pack off and got some water and took a little longer rest this time. I pressed on up the hill and crossed the top of Mary Smith Hill (mile 13.55 – 10:19 am). After passing Mary Smith Hill the trail turned and continued up along a ridgeline gradually climbing to the top of the next hill. While I was hiking it began to rain lightly. The rain did not last long, but it was enough to make me damp and chilly. I found a sheltered spot under some trees and took another rest break (mile 14.30 – 10:45 am). After reaching the summit of the next hill I started the descent down to Mary Smith Hill Road. I reached the vista on the way down and paused for another rest break (mile 15.20 – 11:18 am). It was still cloudy and cool. 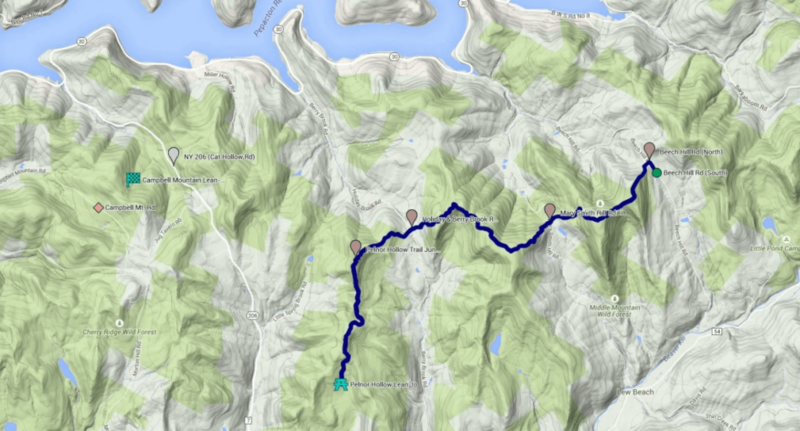 I finished the climb down and crossed Mary Smith Hill Road (mile 15.65 – 11:39 am) and started up the other side. I knew that this was the last road I had to cross and I only had a couple more hills to climb ahead, unfortunately they were the steepest. 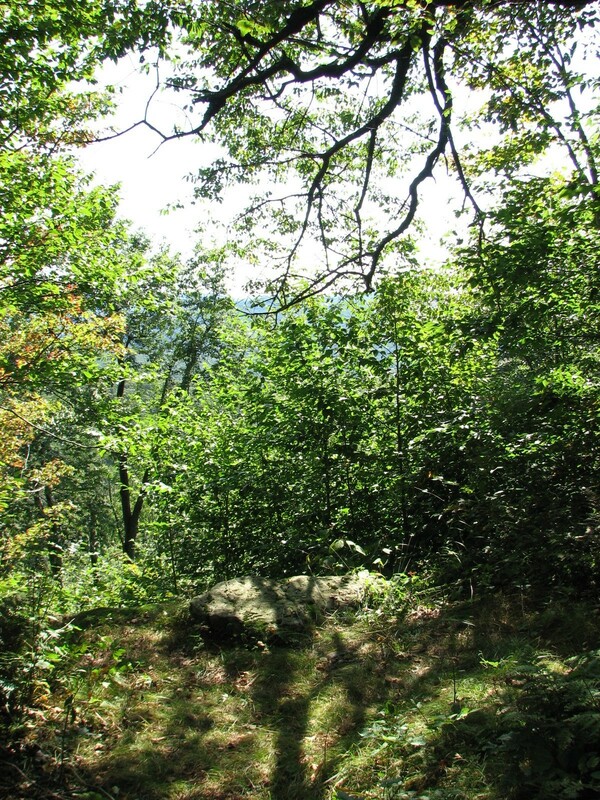 I stopped to rest on the climb up to the top of Middle Mountain (mile 16.10 – 12:00 pm). After a short rest I pushed on again up to the top and then down into the saddle between Middle Mountain and Beech Hill. I passed by the vista without stopping, it was cloudy and I wanted to be back to my car. I took one last break near the top of Beech Hill before starting the last descent down to Beech Hill Road (mile 17.15 – 12:59 pm). The trail dropped down on to the logging trail and turned to the right before leaving the woods. I could see Beech Hill Road down at the bottom of the dirt road. The wind had picked up and the clouds had begun to clear, the sun felt nice after the cloudy and drizzly morning. My feet hurt and my legs, back and shoulders all ached. I forced myself to continue on down to Beech Hill Road and I turned right down the road to the parking area. I was not able to see my car yet, the road rose slightly and curved to the left before reaching the parking area. A few moments later I turned the corner and I saw my car, if I had not been so tired and sore I might have run. As soon as I reached my car I dropped my pack, happy to have the weight off my shoulders (mile 17.95 – 1:35 pm). I changed out of my jeans and into a pair of extra shorts. I also pulled on a clean and dry shirt. I put my pack in the car, signed out of the DEC trail register and started my drive home. One might think that I would consider this my “worst” hike or at least a “bad” hike, but I have never thought that. It was definitely a challenging hike, tough and painful, but that made it more interesting. So I do not categorize it in my top list of “bad” hikes. My only regret with this hike, besides wishing I had known how rugged the terrain was before hiking it, was that I did not take more pictures. I was tired and many times I was only thinking about putting one foot in front of the other, so taking pictures was not a primary concern. My arms and legs were cut and scratched from the briar patch and for the next several days I applied aloe gel to help soothe the stinging and help with the healing. A little over a month later I hiked from Campbell Mountain Road to the Pelnor Hollow trail junction, completing the remaining section of the hike that I had planned as my first overnight. Sounds like you had a nice adventure. I’m envious that you saw the two bears frolicking through the woods. I found the Catskills have many challenging hikes, some that are more scampers than hikes. You might want to go through your pack and trim the weight down a bit. Fifty pounds for a two day hike is quite a lot. My three day pack only weighs 40 lbs. Good luck with future adventures! Thanks for the comment Marty. It was definitely an adventure, a challenging one at that. As that was my first overnight I had more packed than I needed. I have learned since then and have cut down the weight. I still pack things I probably don’t need, but it is a learning process. Scott – Thanks for directing me to your blog from my recent post on the FLT group. Having just read this post, along with your next overnight near Balsam Lake Mtn, I can honestly say I am laughing out loud. I too made myself an overly ambitious first overnight (actually did 2 nights) on my 3-day hike in the Catskills. Based on my experience on the FLT in central sections, I was totally blown away at the terrain and elevation climbs in the Catskills. But, as your comments make clear, I didn’t consider my hike a “bad” one. If anything it has motivated me to do more and now feel confident that, although much of it will be painful, I can do it. This section will be my next one, to the West of Alder Lake, so I am kind of dreading it! Thanks again for all your help. You’re welcome Sue, I hope it helps give you some info. The Catskills sections of the FLT are definitely rugged, but quite beautiful. I remember finding so many spectacular views and wonderful sights. As others have said, with the trail so changeable it does make it something of an adventure. It forces you to be more flexible and “think on your feet”. I personally enjoy the challenge and it is one of the things that has attracted me to the FLT. I could hike trails that are well documented and have been trod hundreds and thousands of times, but that’s really not that interesting to me.